We were sent a Zazoo Photo Clock. The premise behind the clock is that an image will signal your child when it is time to be awake and when it is time to be asleep. Kids and Parents get more sleep! 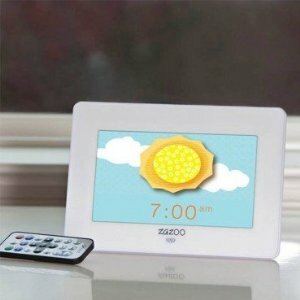 The Zazoo Photo Clock is an innovative sleep solution for children who wake too early or do not stay in bed all night. This contemporary accessory teaches children the concept of “sleep” and “awake” in a fun, educational way. When a child sees a sun, they know it is time to wake (moon: stay in bed until the alarm picture changes). The Zazoo Photo Clock even features a convenient nap-time setting. Parents can use the pre-programmed image set to an alarm time or can easily personalize the awake and asleep photo alarm images using the included USB, flash drive or SD card slot. Ensuring years of use, the Zazoo Photo Clock grows with your child with fun features including a rotating photo frame, music, audio book, alarm clock and video features. The Photo Clock includes music featuring children’s artists from coast to coast. This amazing 11-song compilation of music is built right into the memory of the photo clock. Listen to your own music or play and dance to the built-in tunes. 2011 Award Winner from both the National Parenting Center and the Parent Tested Parent Approved Organization. Getting enough sleep is a challenge for many parents. Children go to bed earlier than adults, and thus they wake earlier too. I value my time when my children are snoozing, and I chose to get up earlier than my kids to practice yoga without interruption. Since we coslept with our babies and preschoolers, our children learned to sleep accordingly. Our family would have no need for this photo clock. I can see that it might be useful for some families, but I also think the real sun and moon may provide the same experience. If you are expecting your children to sleep in past the sun rising, well, that is not really how the human body is designed. There isn’t anything eco-friendly about this photo clock, except that it does grow with your child to be a multimedia gadget. We do have a digital photo frame in our son’s room, as he loves to look at pictures. We do not leave it on all the time. I worry EMF. I wouldn’t want my child sleeping near a device that might emit it. It’s not that I dislike this product, it is that I am not sure of its necessity. Then again, the only time I have had problems with my children’s sleep patterns was when they were newborns, and you really can’t blame them, and after I have stayed up too late, which is my fault. That being said, my kids think this clock is cool. So there you have it. With iPhones, iPads, e-readers and PLaystations, as well as anything and everything digital being available to kids, we find that we are limiting any additional electronic gadgets in to the home. We find that we don’t need any other reasons to sleep in, stay in and not have the kiddos playing outside with their friends.